Collagen is the most abundant protein in the human body and plays a key role in numerous bodily functions. Ingredients: Brazilian Pasture-Raised Bovine Hydrolyzed Collagen - 100% Natural - Pesticide and Hormone Free - Non-GMO Lactose & Dairy Free - Low Molecular Weight For Easy Absorption - Highly Bioavailable - Tasteless, Odorless and Easily Mixes in Any Liquid - Lab Tested With Proof of Purity - No Fillers of Flow Agents An 11-gram serving of Perfect Hydrolyzed Collagen has over 10 grams of protein and no sugar, fat or carbs. 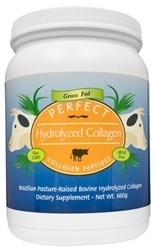 In fact, Perfect Hydrolyzed Collagen tests out at 97% protein, the highest in the industry.